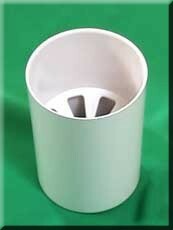 The official cup is 4.25" diameter, 6" high with tapered sides to assist removal. Brilliant white polymers construction, designed to let water pass through. The right tools make all the difference. Set your greens up correctly. 6" high with 4" inside depth. Made of high impact white plastic.